Ground rolling soybean fields prepares the field for harvesting by pushing rocks down into the soil, shattering corn rootballs, and smoothing the seedbed. This allows the combine head to be set low to the ground with less risk of picking up damaging rocks, rootballs, and dirt. However, land rolling also poses agronomic, economic, and environmental risks. These include potential plant injury, soil sealing, erosion, and added expense. Understanding the advantages and disadvantages of land rolling will help farmers decide if — and when — rolling makes sense. How late can you roll soybeans? One of the most important practical questions for farmers is how late soybeans can be rolled without cutting into yield. 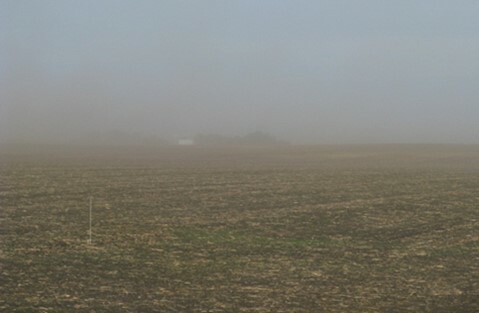 Rolling is usually done immediately before or after planting, but delays for wet weather or spring workload are common. A three-year University of Minnesota Extension research study concluded that soybeans may be safely rolled up to the third trifoliate growth stage, or V3, when bean plants are about three inches tall. In wet years, such as this year, stem injuries caused by rolling could make plants more susceptible to soil-borne diseases. Rolling at or after V3 is not recommended because of the greater potential for plant injury, goose-necking and lodging. Also, wheel tracks cause more plant damage to emerged soybeans than the rollers themselves. Figure 1. 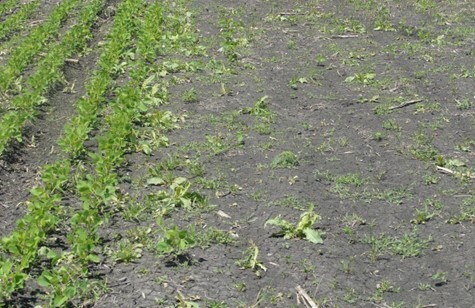 Drown out of young soybean plants due to rolling are shown on the right while left rows were not rolled. The most serious environmental disadvantage of soybean rolling is its effect on soil quality. Rolling crushes surface soil aggregates, increasing the potential for soil sealing, runoff, and erosion. 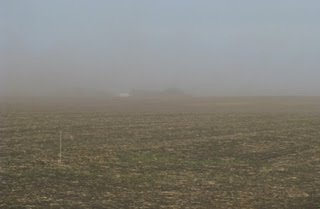 In 2008, a hard rain about the time of emergence caused ponding on rolled research plots in southwestern Minnesota, resulting in 95% reduction of stand (Figure 1). The problem was less severe on non-rolled plots resulting in a 46% reduction of stand. To minimize this problem, leaving approximately 40% residue on the field will protect the otherwise exposed soil. Standing water between the rows of rolled plots after moderate or heavy rains has also been observed in Northern Iowa research fields. This suggests that water infiltration may be slower in rolled fields. Reduced infiltration leads to more surface runoff after rainfall, and contributes to soil and nutrient losses and water pollution. Figure 2. Rolled fields are more susceptible to wind erosion because rolling crushes surface soil aggregates and leaves the field smooth and flat. Both the University of Minnesota Extension and Iowa State University compared water infiltration in rolled and unrolled fields soon after rolling. Infiltration measurements were reduced on the rolled, poorly-drained silty clay loam soil when the slopes were greater than 6%. Rolled research plots also had an increase in soil movement and phosphorus loss. Rolling increases the risk of both wind and water erosion, especially on susceptible soils or sloping terrain. After rolling, residue may come loose from the soil, reducing the soil conservation benefits of less tillage. There are many reported instances of blowing soil and residue after rolling (Figure 2). In parts of Minnesota, blowing corn residue following rolling can become a significant nuisance. Confine rolling to rocky fields and flat fields with low erosion risk. Roll before plants reach the third trifoliate growth stage, or about 3 inches tall. If you roll after emergence, expect some plant injury. If you roll erosion-prone fields, roll pre-plant or post-emergence, rather than right after planting, when erosion risk is greatest. After emergence, roll in the afternoon, during the heat of the day, when soybeans are limp. Avoid rolling in the morning or evening, when plants are most rigid. Roll only when field conditions are favorable. To reduce the risk of crusting or sealing, don't roll when the soil is moist. After emergence, avoid rolling when plants are damp, because they will stick to the tool bar and be pulled out of the soil. Do not roll when it's windy. Consider rolling carefully when there is little crop residue (<20%). The disadvantages may well outweigh any benefits. For more information on ground rolling, see the full article, Management considerations for rolling soybean in the upper Midwest.